Positioned on the wall of Earlsferry Town Hall, the tableau was unveiled in June 1943. The work was the creation of the Polish lady artist Zofia Kruszelnicka and Captain Tadeusz Sieczkowski - adjutant to Colonel Jan Kaminski, commander of the Polish paratroopers garrison in Elie and Earlsferry. 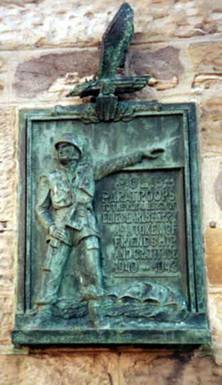 In Earlsferry High Street on a wall of a building there is a metal tableau given by the Polish paratroopers. It is inscribed: Polish Paratroops to the Royal Burgh of Elie & Earlsferry as a token of friendship and gratitude. In October 1940 the 4th Cadre Rifle Brigade which was later renamed the 1st Parachute Brigade moved to this area of Fife. Its commander was Col Stanislaw Sosabowski. The brigade's name was later changed to the 1st Polish Independent Parachute Brigade. Intended to be used in Poland, the brigade however landed in the Arnhem area in September 1944 where it participated in this famous battle. For other Polonica in Scotland connected with the Polish paratroopers visit Falkland Palace and Leven where a Memorial Pillar was erected post-war. On the 23rd September 1943, the anniversary of the formation of the brigade, Lady Wemyss presented the brigade with a standard - a gift from the Scottish ladies of Fife.